The executive business jet is first delivered from the factory assembly line as a “green” aircraft, which has only a factory primer applied to its outer surface. 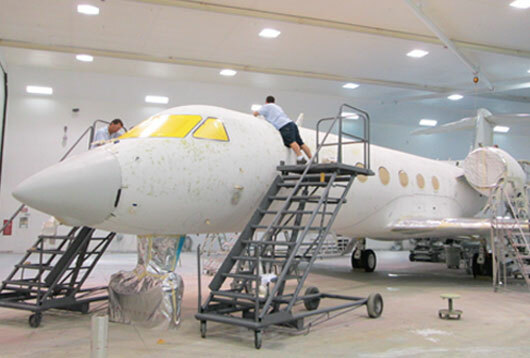 As part of an aircraft completion project, the exterior of the aircraft will be painted, which includes sanding, priming and painting to a high-gloss finish. The exterior finish will usually include a company logo, or other graphic symbols and custom striping. The entire painting process takes approximately three weeks to complete. 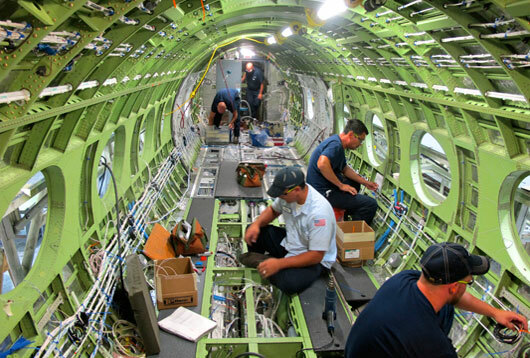 Prior to work on an aircraft’s interior cabin completion, all the production system wiring and plumbing must be installed. This is done prior to any system operations or ground checks. 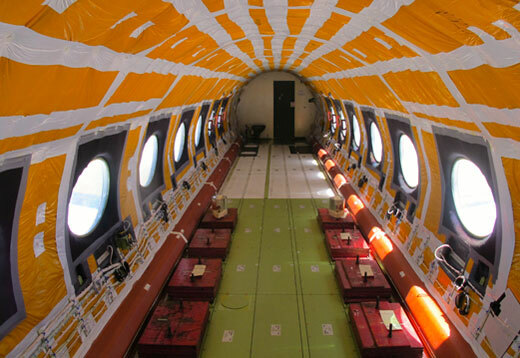 To protect the cabin occupants during flight from the extreme cold and hot temperatures incurred during aircraft operations, insulation is added to aircraft frame. This insulation has the added benefit of being an effective sound proofing material. 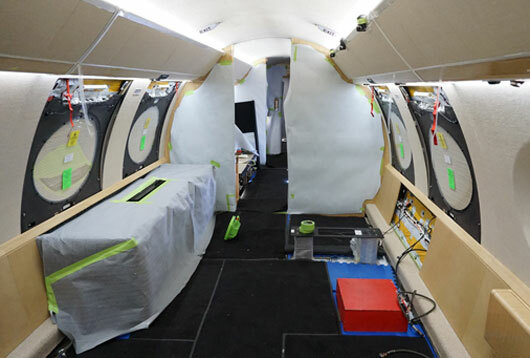 Once all of the system wiring and plumbing has been fitted and installed, and the cabin interior protected with an insulated blanket, the aircraft is ready to be flight tested to receive its FAA certification. Red or yellow weights are mounted on the cabin floor to simulate what the completed interior will weigh. At this phase, the completion of the green aircraft is at approximately ninety-days into the process. 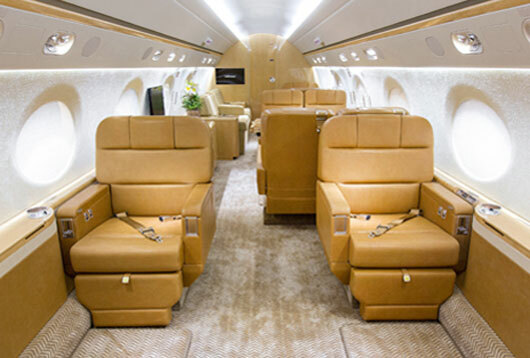 An aircraft interior is personalized to the owners tastes, amenities and requirements, these include custom entertainment, phone, and internet systems. The cabin is fitted from front to back with custom fabrics, leather, veneer, and carpet. Once the basic flooring, sidewalls, and headliner are installed, the cabin is equipped with chairs, tables, a credenza, and workstations. After the cabin seats, furniture and amenities have been installed, the cabin interior goes through an FAA inspection to become certified. The aircraft is then test flown multiple times for sound and temperature surveys. 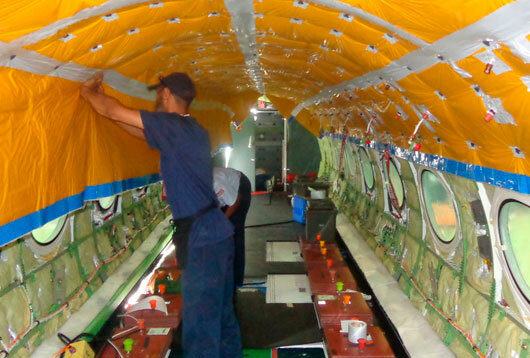 The interior adjustments and the operation of the cabin systems are tested at high altitudes and over long durations. A typical cabin checkout flight ranges from six to ten hours. 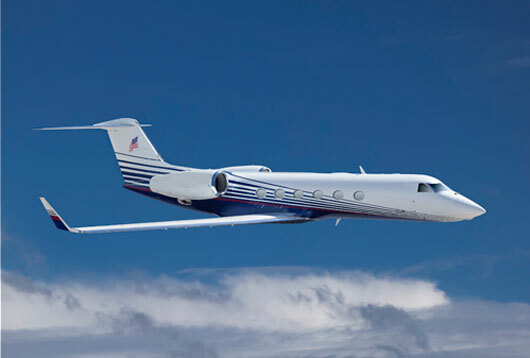 Once the FAA inspection is complete and the aircraft has passed its checkout test flights, the aircraft in now ready for the owner to take delivery of a newly completed, state-of-the-art personal executive business jet – all set to take him or her anywhere their personal and business travel requires in luxury and style.